Every year, approximately 200 people are diagnosed with mesothelioma in New York. While the rate of this disease in New York is not increasing at the rate it was in the 1970s and 1980s, it is still continuing to rise, according to the New York State Department of Health. Mesothelioma is an aggressive form of cancer that is often not diagnosed until it has reached a late stage, and the prognosis is often grim. People with mesothelioma are typically unable to work and face expensive medical treatments in the short amount of time they have to live. Mesothelioma is almost always caused by asbestos exposure. If you were exposed to asbestos and have been diagnosed with mesothelioma, you may have the right to recover damages. The experienced mesothelioma lawyers of Neblett, Beard & Arsenault can investigate your claim, ensure you have access to the resources you need during this difficult time, and fight for your fair settlement. Asbestos was widely used in New York construction projects throughout the 20th century because of its insulating and fire-resistant qualities. Asbestos is heat resistant and a common material used on ships. Different types of factories, including paper mills, used asbestos in machinery and tools. Asbestos was commonly used in airports and train stations. As in other industries, power plants often used asbestos as insulation. When an older building is destroyed, asbestos can be released into the air. This can happen because of a fire, a demolition, an explosion, or a catastrophe such as what happened at the World Trade Center site on September 11, 2001. Talc and asbestos are often found together. When the talc is mined, it can disturb the asbestos and expose miners to asbestos. You may also find support through Facebook groups or other online venues run by organizations such as the Mesothelioma Applied Research Foundation. Your time for pursuing a mesothelioma case is governed by the New York Statute of Limitations. 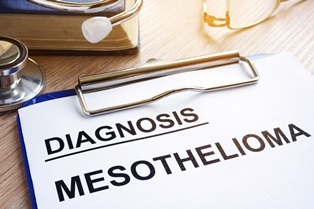 In most cases, you have three years to file a personal injury case if you have been diagnosed with mesothelioma. You have two years to file a wrongful death lawsuit if your loved one has died from this disease. The time to file a claim begins when you learn of your illness or should have learned about it. Our mesothelioma lawyers want to help you get the fair recovery you deserve. If you have been diagnosed with mesothelioma, we will do a full investigation to find out where and when you were exposed to asbestos. Then, we will fight for your fair financial compensation. We understand that the stress and expense of a lawsuit can be overwhelming, but we don’t want that to stand in your way of justice. If we represent you in a mesothelioma case, we will handle all aspects of your case, and you won’t owe us any legal fees until your claim has been successfully settled. To learn more, please contact us online or call us directly at 318.588.6303 to schedule a free, no-obligation consultation.